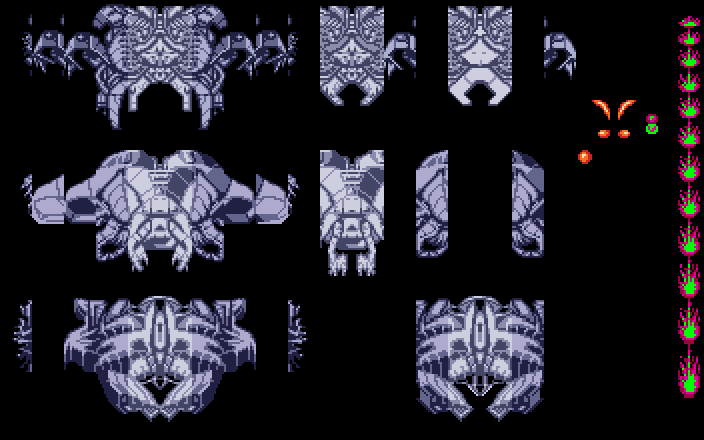 The bosses were created by placing six 4 color sprites (16 pixels wide) next to each other (creating a single sprite with 80 pixels in width). The sprites' colors switch in the middle and they also change when being hit by the player. This is possible because two sprites share the same 4 color palette. Therefore the middle two sprites share one palette, while the outer two sprites share another palette, and so on. Shots and orange overlays are created with more sprites. Hybris used sprites very efficiently, which is one of the reasons why it was able to keep the silky smooth 50fps frame rate even on the old Amiga 500.